In the 1950s, brands slowly moved to TV, just as they have started to move online today. In both instances, buying and selling systems improved; audiences and new content quickly moved to the new medium; and the creative possibilities inspired great ad campaigns. ents in measurement—like ratings and quantitative market research. Once major brands could see who they were reaching and what impact their campaigns were having, they fully embraced the medium, creating a multi-billion dollar industry...and TV’s golden age began. Unlike the early days of TV, digital advertising is already incredibly measurable. The only problem is a very old and well-known one: the standardized metrics today are largely clicks, user interaction rates and conversions. consumer goods companies - know, it’s a challenge to measure changes in brand favorability of a movie or whether an online campaign is driving more consumers to the store. And it’s even harder to take quick action on any such insights. 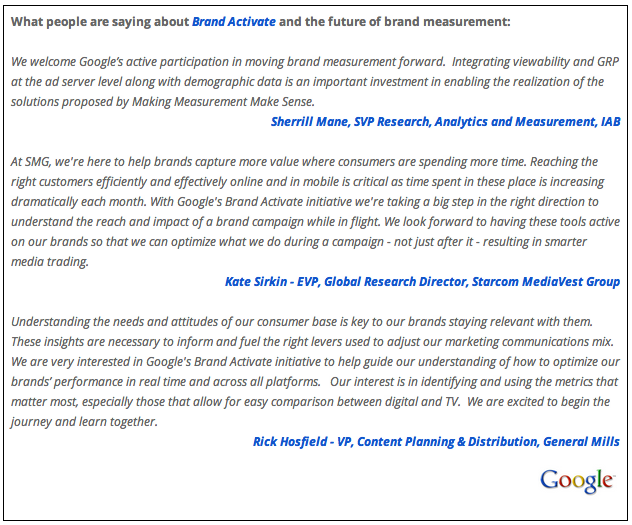 That's why today, at the Ad Age Digital Conference I'll be introducing the Brand Activate Initiative, an ongoing Google effort to address these challenges and re-imagine online measurement for brand marketers. With this initiative we're partnering with the industry and supporting the cross-industry Making Measurement Make Sense (3MS) initiative. We believe that the industry’s significant investment in brand measurement efforts can substantially grow the online advertising pie, for all. Is a particular ad in your campaign especially useful at improving brand recall in Illinois? You should be able to immediately increase your coverage throughout the Midwest. Is one ad slightly less effective at driving purchase intent and in-store sales? Tweak the creative, straight away. We’re working to build truly useful brand metrics into the tools that advertisers already use to manage their campaigns, so they’ll be actionable within seconds, not months. Active View: Advertisers have long looked for insight into whether consumers saw an ad on page 145 of a magazine, or switched the channel during a TV commercial break. It’s similar online, so we’re rolling out a technology, which will be submitted for Media Rating Council (MRC) accreditation, that can count “viewed” impressions (as defined by the 3MS coalition's proposed standard, this is a display ad that is at least 50% viewable on the screen for at least one second). Called Active View, this will first be available in coming weeks within Google Display Network Reserve. We’ll also be making this metric a universal currency, ultimately offering it within DoubleClick for Advertisers, as well as to our publisher partners. Active View data will be immediately actionable—advertisers will be able to pay only for for viewed impressions. Going forward, we’re working on viewed impression standards with 3MS, and our agency and publisher partners. Built-in: Active GRP is built right into the ad serving tools that our publishers and marketers already use every day. Active GRP will enable real-time decision making, allowing advertisers to make adjustments to their campaigns at the speed of the web. We’ve kicked off a pilot program for DoubleClick for Advertisers clients as a first step, and will roll it out to other products, with brands able to specify a range of audience GRP segments. Robust methodology: Active GRP is calculated by a statistical model that combines aggregated panel data and anonymous user data (either inferred or user-provided), and will work in conjunction with Active View to measure viewed impressions. This approach overcomes problems of potential panel skewing and reliance on a single data source. This approach also has the advantage of never using personally identifiable information, not sharing user data with third parties, and enabling users, through Google’s Ads Preferences Manager, to opt-out. We will be submitting our methodology for MRC accreditation. 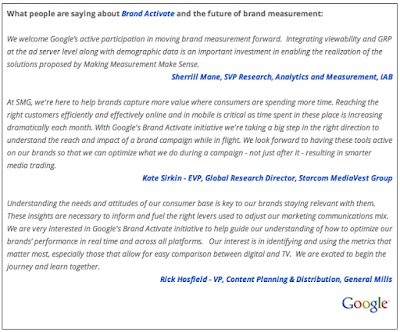 We look forward to bringing other measurement initiatives into our suite for brand marketers, including a brand impact survey pilot with Vizu, our brand lift measurement product (Campaign Insights) and various cross-media measurement research projects globally. This is just the beginning of the Brand Activate Initiative, with much more to come for brands and publishers. We think that with brand new metrics comes a new brand moment - one that will encourage brands to invest in the web, help publishers show the value of their digital content, and stimulate digital media’s own golden age.